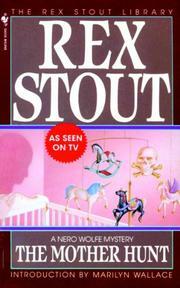 Skillful plotting and a somewhat unusual idea make this basically a good Rex Stout. Archie emerges as something of a fourflusher, again using his sexual magnetism to get his results. And Nero Wolfe is forced to bestir himself to cope with a delayed result, quite different from his usual speedy operation, in linking the mother, whose baby was laid on a client's doorstep, and a murderer. Dependable.